Don’t you love the look and feel of a new kitchen? The wonderfully gorgeous floors, shelves and cabinets make even the dullest kitchen chores exciting. Not to mention the pearly white bathroom tiles –you don’t feel like stepping out of the shower for hours. However, the tiled floors in our living rooms, kitchen and bathrooms begin to soil until they’re almost unbearable to walk on barefoot. No matter how hard you try to keep them clean, one of these days you will spill something that will leave a stain on those tiles. Even if you manage not to spill, you will still notice the tiles getting yellowed and the grout filling up with gross dirt. Dirty floors mean that your family is vulnerable to diseases and creepy crawling insects and worms. For moms that have infants who have recently started crawling, dirty tiles and grout can be one of the most hazardous things in their home. In such a situation, the best thing to do is get your cleaning supplies out and start scrubbing. If you’re the kind of person that doesn’t mind rolling up their sleeves and putting on some gloves, then cleaning your own tiles and grout will be a good option. The most important allies for you in this case would be vinegar and baking soda. Dilute vinegar in equal amount of water and spray on tiles. Use a stiff brush in circling motions to clean your tiles. For the grout, make a paste out of baking soda and water. Use a smaller brush to remove debris from the grout in the same round motion. In the end, use water to rinse the floor and mop the excess liquid with clean sponge or dry towel. In case you don’t want to start from scratch, you can pick a generic household tile and grout cleaner from the market and use it to clean your surfaces. However, if the stains are tough to get out, you might have to go for some heavy-duty cleaners, such as oxygen bleach powder, hydrogen peroxide or chlorine bleach. This tip can be somewhat dangerous as heavy-duty cleaners have immense oxidizing and acidic power. They can immediately burn skin or soil floors if not used correctly. Many homeowners do not want the hassle of DIY floor cleaning. The best and safest option is to hire a professional tile and grout cleaner. Since they are the expert at what they do, professional tile and grout cleaning companies have the most advanced machines to get even the toughest stains out of your home surfaces. They use degreasing agents to get the sticky fats off your floors, without ruining the stone underneath. Their high pressured steam extraction machines rinse the floors in one easy go, followed by air movers that dry them quickly. 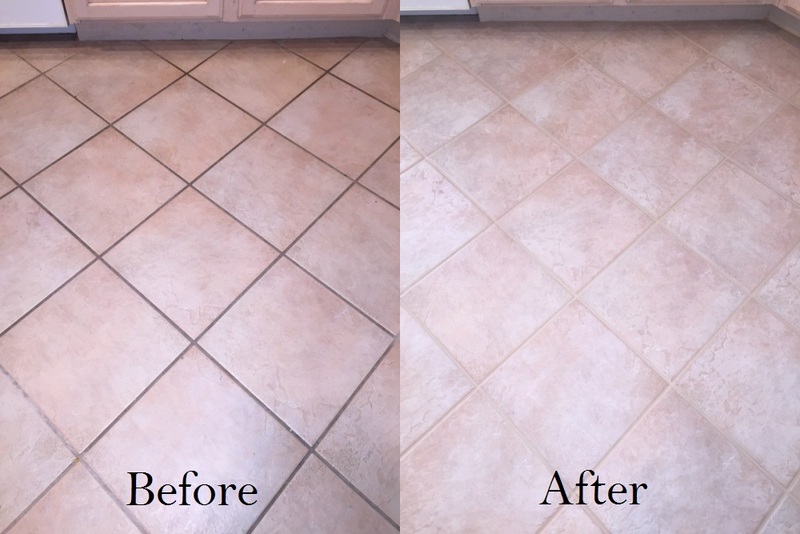 A professional tile and grout cleaner like Advanced Surface Solutions LLC will seal your newly restored grout joints to protect them against further soil, and use a floor machine to buff up your floors, making them look as good as new. As a result, hiring a professional not only saves you all the hassle but also gives you quality work without any hazards to your own health.